Sagamore Farm’s multiple stakes winner Recruiting Ready takes another shot at adding an elusive graded triumph to his resume when he faces seven rivals in Saturday’s $100,000 Gulfstream Park Sprint (G3). The 40th running of the six-furlong Gulfstream Park Sprint for 4-year-olds and up is the third of nine graded-stakes worth $1.65 million in purses on a blockbuster 14-race program featuring the $400,000 Xpressbet.com Fountain of Youth (G2). First race post time is 11:30 a.m. Recruiting Ready, a 5-year-old son of 2012 Holy Bull (G3) winner Algorithms, has earned $519,645 in a career that includes 12 top-three finishes from 17 starts and stakes wins at 3 and 4, among them the Chick Lang at legendary Pimlico Race Course. The six-furlong Chick Lang will be run as a Grade 3 in 2019. In his most recent start, Recruiting Ready dueled with fellow multiple stakes winner World of Trouble, runner-up in the 2018 Breeders’ Cup Turf Sprint (G1), in an off-the-turf edition of the Gulfstream Park Turf Sprint Jan. 26 before finishing a decisive second. He has breezed twice since at Palm Meadows, Gulfstream’s satellite training facility in Palm Beach County. 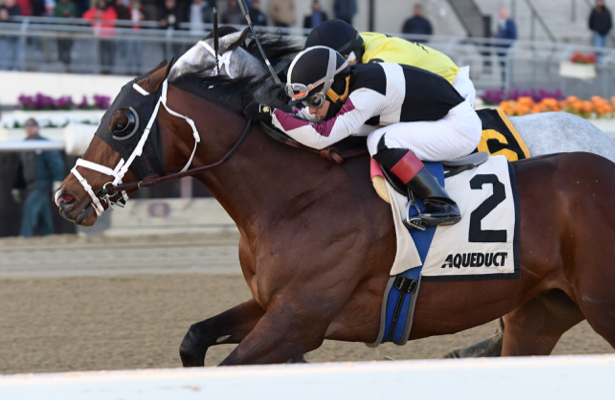 Recruiting Ready owns four wins and has been worse than third just twice in nine tries at six furlongs, also winning the Gravesend Stakes Dec. 23 at Aqueduct and 2017 Bachelor Stakes at Oaklawn. He has faced graded company five times with one second and two thirds. “I think six furlongs is his best race,” Hough said of Recruiting Ready, the 6-5 program favorite who will have two-time defending Championship Meet leading rider Luis Saez up from Post 1 at co-highweight of 121 pounds. Sharing the impost is Midwest Thoroughbreds’ Florida-bred Quijote, a veteran of 24 starts with eight wins, the last coming impressively in the six-furlong Sunshine Millions Sprint Jan. 19, his first start for trainer Georgina Baxter. The 6-year-old Pomeroy gelding’s four career Gulfstream wins also include the seven-furlong Big Drama Stakes in 2017. In the Sunshine Millions Sprint, Quijote gained a contending position early but was allowed to settle behind a sizzling speed duel between X.Y. Jet and Ray’swarrior and swept past both for a 3 ¾-length triumph in 1:09.98. Second choice on the morning line at 3-1, he will be ridden back by 2018 Eclipse champion Irad Ortiz Jr. from Post 4. The Four Horsemen Racing Stable and Lady Lindsay Racing Stables’ Sweetontheladies will be looking for his first win since the Crystal River Handicap in June 2017 at Gulfstream. During that 18-race stretch, the 5-year-old son of Twirling Candy has placed nine times, eight of them in stakes, including the H. Allen Jerkens (G1) at Saratoga, Gulfstream’s Smile Sprint (G3) and Frank J. De Francis Memorial Dash (G3) at Laurel Park last summer and fall. Sweetontheladies ran third in the Sunshine Millions Sprint, and returned to be second in the Pelican Stakes Feb. 19 at Tampa Bay Downs. Overall, he has earned purses of $383,962 from 24 career starts. Marcos Meneses has the call on Sweetontheladies from Post 6 at 119 pounds. Santiamen, Pass the Butter and stablemates My Chinumado and Millionaire Runner are also entered.